Vijay comes with 25 years’ experience in the IT space. He is a successful entrepreneur having started and succeeded in 2 ventures earlier. He brings in leadership and financial discipline to the organization. His success lies in finding, growing and retaining key talent in the organization. He is passionate about building a highly HR friendly organization, and is key in driving Locuz towards PCMM Level-5 status with the objective of making Locuz an ‘Employer of Choice’. He has done his Masters in Management, and has attended various executive training programs conducted by Business Schools (IIM-A) and other professional organizations. His subjects of interest are Business Strategy, Human Resources & Finance. He has given several lectures in various forums on Leadership, Empowerment and Time management. Uttam is one of the technology visionaries of the company. As Chief of Consulting & PS he is responsible for services operations and consulting assignments of Locuz. He was the chief architect of the first ever Digital Library in India. He also has been the prime facilitator to set a Centre of Excellence in Medical Bioinformatics in India – networking some of the leading Post-Genomics organizations to collaborate using technologies like GRID computing. 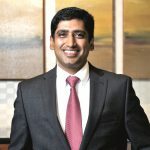 He served on the board of advisors to STPI (Software Technology Parks of India), a Government of India organization to set up a BIO-IT Park in India. He is currently on the CFRD (Centre Facilities for Research and Development), Osmania University committee. He has in the past been on the Channel Advisory Board of Cisco Systems for Strategy in the APAC region. Uttam is an Engineer in Electronics and Communications and possess several professional qualifications. He has presented papers in various forums on Information Security, HPC Clusters, Digitization, content creation/delivery, and Infrastructure Management. He also has been a guest speaker in prestigious IT and few other Industry events. Durganadh K Venkata, is an industry specialist in the area of consultative selling of IT Infrastructure solutions. Durganadh joined the Board of Directors for Locuz in 2005 and is presently the President of US subsidiary Locuz Inc.
Durganadh in the past has led the growth of Locuz India, by bringing in sales discipline, fostering an extended leadership team, instilling the focus on value-based engagements and providing visibility within our partner eco-system and within the industry. Durganadh joined Locuz from IBM, where he spent almost 7 years handling various functions in the IBM Systems group and in IBM Global Services. In his final assignment, he successfully grew the Systems (servers & storage) business for IBM in the Telecom sector. Prior to this, he led teams and managed a significant part of the IBM iSeries server business. Durganadh also worked with IBM Global Services in 2001 as a member of the Networking & IT Infrastructure services division in Bangalore. Prior to IBM, Durganadh worked with Tata Steel for 3 years and was based in Kolkata, as part of the commodity trading team. While at Tata Steel, he carried additional responsibilities for managing IT needs of his profit center. Durganadh completed his MBA program from Indian Institute of Foreign Trade (IIFT) Delhi in 1996, prior to which, he graduated in B.Tech (Computer Science) from the Jawaharlal Nehru Tech University (JNTU) Hyderabad in 1994. Durga (as his friends call him) is a keen reader, likes to visit new places and loves to unwind by solving crosswords. Arif comes with IT industry experience of 17 years in varied areas like Technology Sales, Marketing & Business Development, People Management, Leadership development and Operations. Prior to this role, Arif was the Country Head for the organization’s PSU business. Under his stewardship, the PSU business grew manifold, both within the traditional markets of Locuz, and also in emerging locations like Pune & Chennai. During this period, Locuz became a name to reckon with in the Education and Research space by recording consistent growth in revenues. Before taking up the PSU mantle, Arif successfully led the Branch Operations of Karnataka for a period of 4 years since inception. He was able to effectively grow that region from a single man unit to a populous profit-generating branch. Asit Sahoo is the head of technology and professional services delivery at Locuz. The technology practices that he leads are High Performance Computing, Datacenter / Workplace Transformation (Cloud) & IT Automation. Asit’s vision & leadership has resulted in Locuz acquiring enviable technical prowess in these domains. His was instrumental in Locuz developing technology tools in the areas of HPC applications and Cloud automation. Asit comes with IT industry experience of 15 years in varied areas like service delivery, pre sales, consulting & people management. He has led technology initiatives, which entail innovation and IP creation at Locuz. Prior to this role, Asit was the technical consultant for HPC & DC business. His leadership and team building skills were chiefly responsible for Locuz becoming a name to reckon with in the HPC space. His team played a key role in architecting, deploying and managing complex HPC, storage and virtualization implementations in India and abroad. He is a certified professional in VMware, Citrix, Netapp, EMC, Microsoft, IBM and Solaris. Vivek Amble is the Vice President of Technology Innovation for Locuz Inc . He has a demonstrated history of working in the information technology and services industry over two decades. He’s skilled in technology infrastructure services, cyber security, compliance, global delivery, databases, business development, pre-sales and business intelligence. He’s responsible for leading the innovation program at Locuz globally as the Chief Innovation Officer and Executive Director of Locuz Inc.
Vivek has advised and partnered with Fortune 50 CxO and Business Leaders in Technology selections and deployments.